Is Netflix(NASDAQ: NFLX) original programming like The Crown more interesting to watch than the Golden State Warriors' bid to run away with the NBA championship? 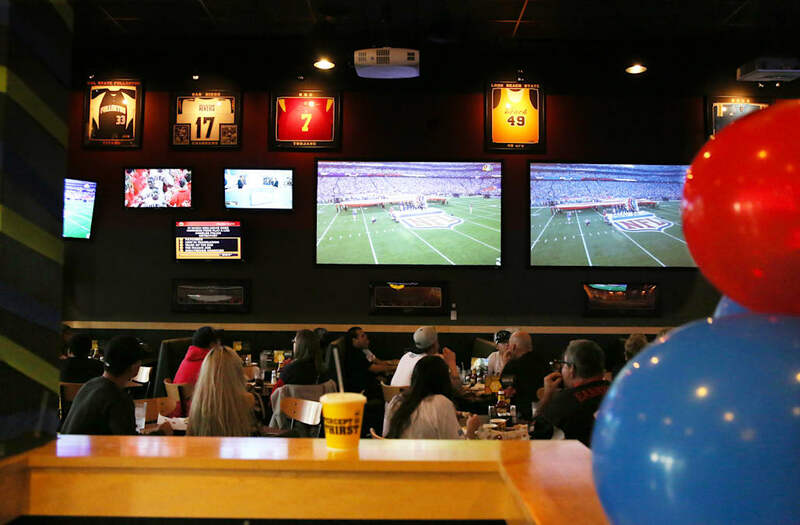 Could be, as the movie streaming giant continues to add to its subscriber base while sports bars like Buffalo Wild Wings(NASDAQ: BWLD) lose customers quarter after quarter. Netflix reported in January that it had added a record 7 million new subscribers to its rolls in the fourth quarter, bringing the streaming provider's worldwide membership to 93.8 million. In contrast, Buffalo Wild Wings said total revenue for the chain rose less than 1% in the fourth quarter as same-store sales tumbled 4% -- the fourth straight quarter such sales have fallen, causing profits to plunge over 38%. Kicking back at home and taking in a movie or the game with friends is apparently more popular than going out, and that could be a troubling development for the beer-and-wings joint, which is under attack from an activist investor looking to overhaul the chain. There's even some evidence to back up the intuition. Location intelligence company Foursquare found that liquor stores, including wine and beer shops, saw a 20% increase in visits in 2016 compared to the year before, while bars only saw a 2% rise. Sports bars, on the other hand, witnessed a 3% drop in visits last year. Buffalo Wild Wings has built itself on offering wings, beer, and sports, so the Foursquare data is troubling for B-Dubs investors. More than 50 million people use Foursquare's City Guide to discover new locations to visit, and it's recorded more than 10 billion check-ins. There are an average of 9 million check-ins a day on Foursquare Swarm, which it describes as making "a game of life," where you can earn real-world perks as well as fun accomplishments, such as being named mayor of a spot if you check in there enough times. The location app has also discovered that once people hit their local liquor store, they often make their next stop the supermarket, which was visited 8% of the time immediately after a liquor store trip. While that could suggest some seriously skewed consumer priorities, what it likely means is that shoppers are preparing for a stay-at-home, bring-your-own social event. Foursquare posited that the bigger increase in liquor store visits, as compared to bar visits, could be part of a "Netflix and chill" phenomenon. The restaurant industry at large is experiencing malaise. Customer traffic at restaurants was down 5% last month and comps fell almost 3%, according to Nation's Restaurant News, one of its worst performances in the past four years. (Guest checks, however, were 1.2% higher and are up 2.3% over the last six months.) With food price deflation in full swing at grocery stores, consumers are simply finding it a better value to cook at home instead of going out. Buffalo Wild Wings hasn't escaped the overall malaise, in addition to any restaurant-specific issues, and activist investor Marcato Capital Management thinks the sports bar chain isn't doing enough to turn things around. In part, it has recommended B-Dubs seek out "strategic alternatives" for the chain, make substantial management changes, improve its capital structure, and expand franchising opportunities. It subsequently nominated four people to serve on the board of directors. Yet as much as staying home and watching movies or television might be impacting Buffalo Wild Wings' bottom line, it's clear other factors are also at play, because where the beer-and-wings joint continues to report falling sales, rival Dave & Buster's Entertainment(NASDAQ: PLAY) is see strong growth. In its fiscal 2016 third-quarter earnings report in December, Dave & Buster's said revenue jumped almost 20% in the period on a near-6% rise in comps, which were boosted in part by a 7.6% increase in special events sales. It may be helped along by the fact there's more of an arcade experience at Dave & Buster's with its games and entertainment than at B-Dubs, which opts for a sports stadium-like environment. It may just be that visiting an adult version of Chuck E. Cheese is simply more popular than a beer-and-wings sports bar. Yet that also means Buffalo Wild Wings may continue to experience the chilling effects of consumers picking up their adult beverages at the liquor store and spending the night at home streaming movies or watching the game on TV with friends. David and Tom just revealed what they believe are the 10 best stocks for investors to buy right now... and Buffalo Wild Wings wasn't one of them! That's right -- they think these 10 stocks are even better buys. Rich Duprey has no position in any stocks mentioned. The Motley Fool owns shares of and recommends Buffalo Wild Wings and Netflix. The Motley Fool recommends Dave and Buster's Entertainment. The Motley Fool has a disclosure policy.